These are 8-portion packs weighing 1.35kg. Other sizes are available in most of the varieties. A milk based soup with leeks and potatoes blended until smooth. Mixed beans, pulses and vegetables in a light herb infused soup. A tomato based soup with bacon, vegetables, potatoes and spaghetti. Peas, ham and onion cooked in a chicken stock, blended and thickened. Root vegetables cooked in a light vegetable stock with peas and pearl barley. Shiitake, Oyster, Chestnut and Button mushrooms lightly cooked in milk, blended and thickened. Our version of a classic soup with tomatoes, root vegetables and balsamic vinegar. 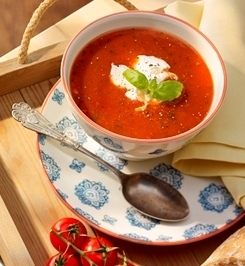 A rich tomato soup with the addition of roasted peppers and basil. 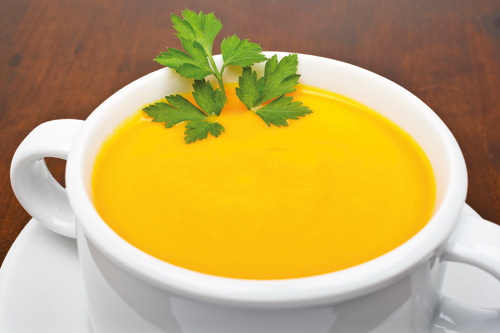 Root vegetables, peas and potatoes with a hint of tomato make up this light soup.